Medical assistants work alongside doctors performing a wide variety of tasks including helping patients, performing minor procedures, and various administrative work. Medical assistants work mainly in facilities that handle outpatient procedures (or ambulatory care) as opposed to hospitals with larger, more specialized, staff. 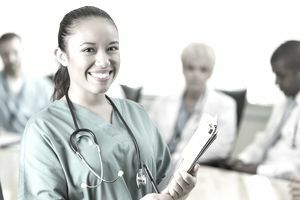 While there is some overlap between medical assistants and other medical support staff (such as nursing assistants) medical assistants have a distinct role and skill set. To become a medical assistant, you must complete a training program, but you don't need a license. While your training will prepare you to do your job, understanding the skills you'll need will help you prepare your resume and ​cover letter. Different employers may emphasize different skills when hiring staff, so be sure to read all job descriptions carefully. Be ready to provide examples of how you embody each skill because most likely your interviewer will ask you to provide explanations. Medical assistants use several different skills when completing tasks otherwise performed by doctors, nurses, receptionists, and administrative assistants. These office skills are similar to those done by an administrative assistant in any field. You’ll need telephone courtesy, strong written and verbal communication, and strong customer service skills. You will have to handle correspondence, billing, bookkeeping, and you’ll have to troubleshoot computer problems. If you have experience with a particular computer system or software, mention that in your resume. Medical administrative skills include monitoring inventories of medical supplies and re-ordering as needed; scheduling appointments; arranging for hospital admissions; working with laboratory services; updating patient records, and recording medical histories. You'll also have to handle billing which involves processing insurance forms, reconciling co-pays, resolving insurance billing problems, and advocating for patients with their insurance companies. Medical assistants are not doctors or nurses but must provide simple medical and nursing care under the direction of doctors. You'll be asked to administer medications including injections, apply dressings, draw blood, remove sutures, and convey information from doctors to patients and vice-versa. You’ll have to follow infection control and safety guidelines as well as quality control standards when sterilizing and setting up instruments, maintaining medical equipment, and preparing treatment rooms for patient examinations. When you apply for a job be sure to specify relevant certifications in these areas. Emphasize the personal qualities you possess that make you the best person for the job you're applying for. To be a medical assistant, you have to be detail-oriented, committed to accuracy, empathic, and adaptable. You must also be able to multitask. You must know your own limitations in order to take care of yourself and remain healthy for your patients and colleagues. You should be well-organized, capable of prioritizing and problem-solving, and able to collaborate with team-mates. The skills below show your aptitude regarding medical-related administrative practices typically found in medical offices. They also demonstrate your understanding of the medical field, current regulations, and insurance practices. These office skills show that you can handle standard office procedure. Experience with specific phone systems, PC or Mac computers, and medical records management software is required. These skills show your depth of experience in performing medical tasks and procedures. Be sure to include any certifications you have. If you’re applying for a job that mostly involves working with patients, these skills will demonstrate which situations you can handle with competency. When interviewing, be prepared to discuss specific experiences with patients and how you handled them, while maintaining patient confidentiality. Emphasize the personal qualities you possess that make you the best person for the job you're applying for.